An Indian woman probably wore only gold and precious gems in olden times,but nowadays most Indian women have embraced modernity in lifestyle and fashion. If you ask me, I would say that a Indo-Western “fusion” kind of jewelry is what most modern Indian women wear on a daily basis- though the metal of choice for most women remains Gold. For casual jewelry however, these 5 are my picks for a modern, feminine look that’s global yet unique! I love this shade of Oriental Violet! (I have acrylic paint in somewhat the same shade of purple which is called Oriental Violet…so I’ll be using that term to refer to this color.) 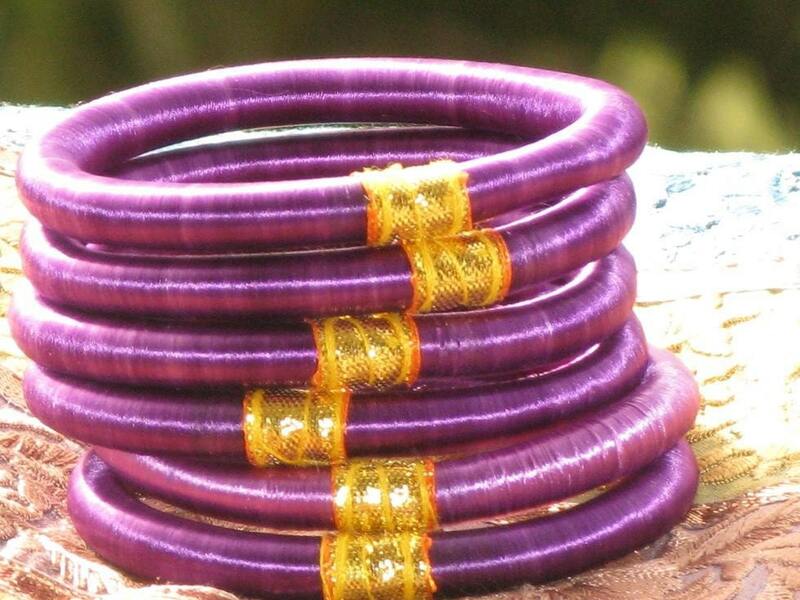 I would team this with a black blouse and jeans or a skirt – these bangles from Exotic Bangles would be such a nice pop of color! 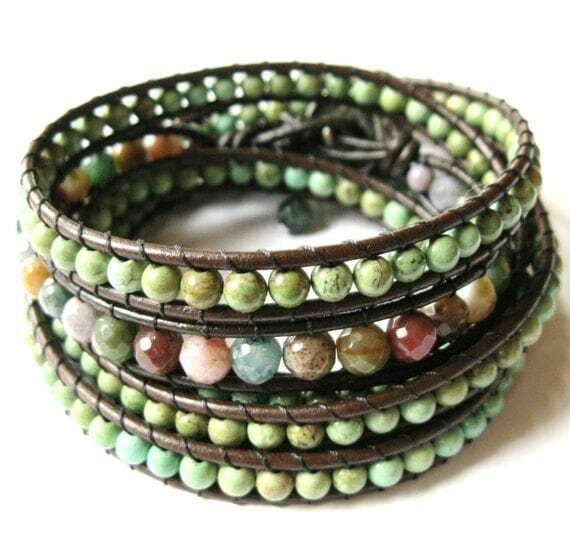 I ABSOLUTELY cannot resist this earthy wrapped bracelet by MadRiver Designs that can also be worn as an anklet. 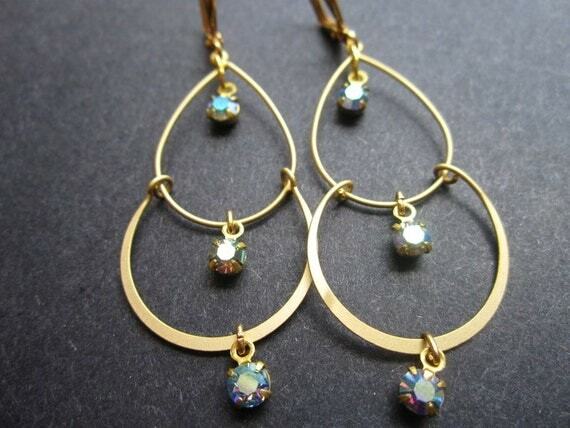 I have no words to describe how these sparkly Celestial earrings by Meenoo of Minou Bazaar make me feel! Maybe it’s because I am a Cancerian who is governed by the Moon but these aurora borealis rhinestones are so soothing to my eyes. 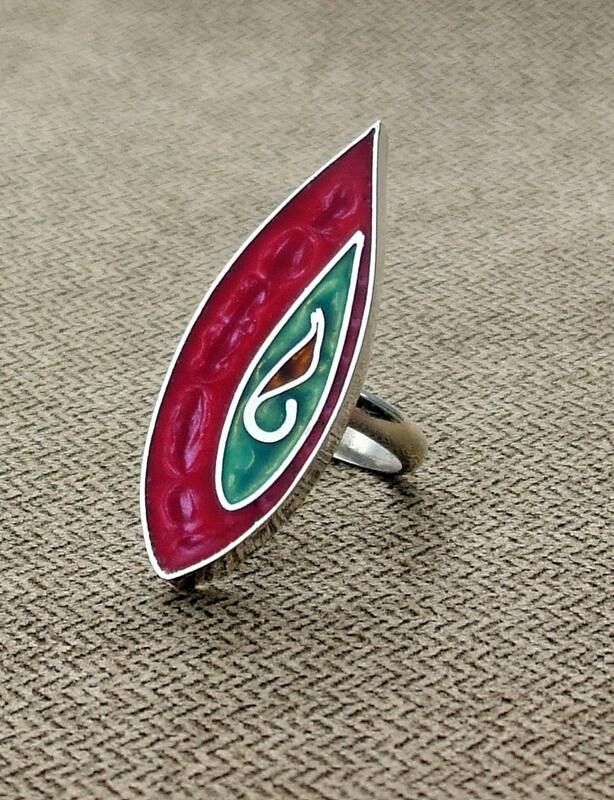 Great for an evening out, don’t you think? 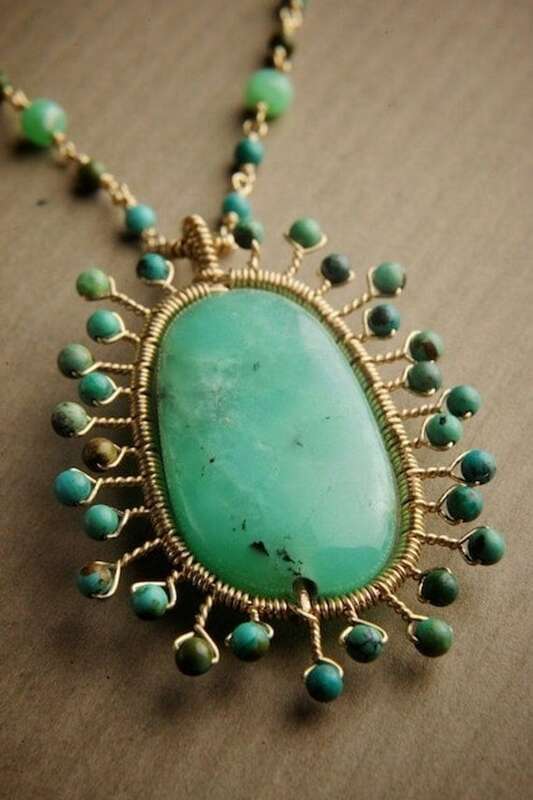 This necklace by Gurmukh Khalsa of MosaicDesign has such oomph factor with its gorgeous green Chrysoprase pendant surrounded by little Turquoise ray. I would wear this with a simple white shirt and blue jeans any day!! I’ll leave you to drool over this peaceful, dreamy yet strong leather cuff bracelet also by MadRiver Designs. These bracelets are too hot to handle! I’m sure you don’t want to miss out on the fun. 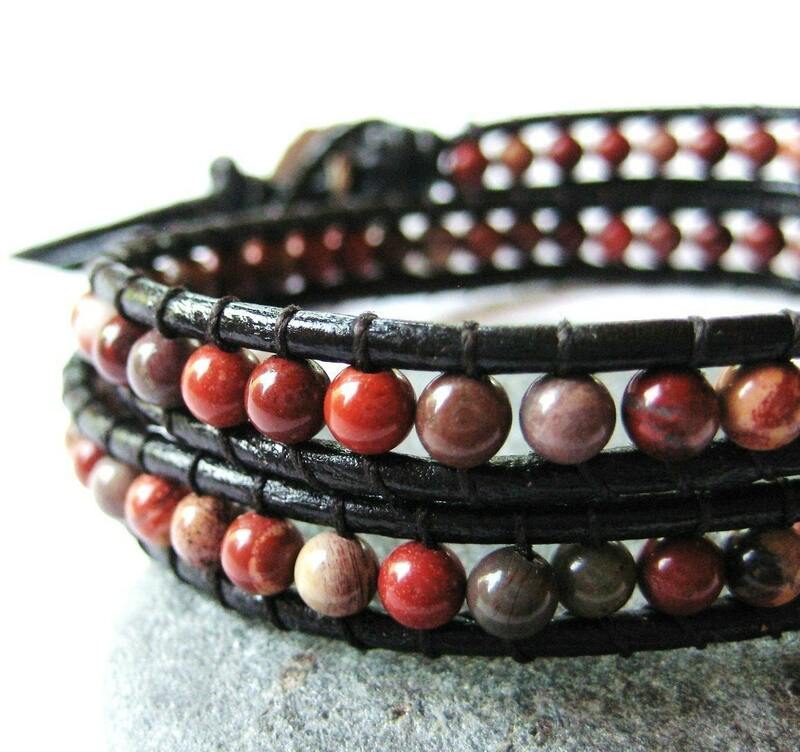 Head over to the Art Bead Scene Blog to try out their free Memory Wire cuff bracelet project. Let me know how it goes. I’d love to see your creations. P.S: I am planning to post my favorite Etsy picks from now on. If you think your Etsy shop could do with more customers discovering it or if you have a great product that you would like me to feature- please email me at craftzy@gmail.com! very cool collection! I LOVE using Indian designs as inspiration for my jewelry as well, it’s such a rich culture! My husband is Indian and we live in Malaysia, so it’s easy to see Indian influences and inspiration here! Loved the collection. Specially the silk Bangles.